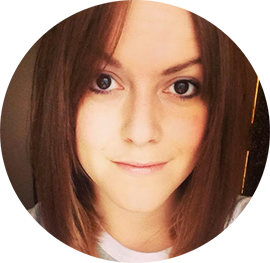 Hair Advice (+ all things nice) | UK Hair Blog: Roo-ting for them! The only way round this was to get a pouch or tool belt, which are getting popular with hair and make up stylists nowadays and you can get all sorts of shapes and colours. I found whilst searching a site called Roo, I knew then my search was over! They had the most amazing pouches and at great prices, and they are a UK based company. I chose this one and I'd recommend the pouches to anyone who works either a hairdresser or make up artist. The colour is amazing (cherry bomb) and as I generally wear Black when working it gives a pop of colour much needed! This isn't a sales blurb and I've not been given anything by the company I just really rate the designs, material and overall standard of finish so thought I'd share! Right I'm off, my sister is on route from the west country so must tidy the house! 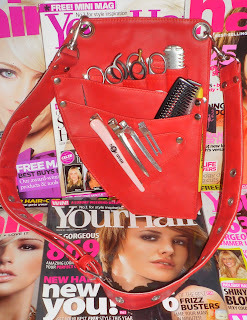 What a cool site - I love those funky nail scissors and the make-up brush rolls! You're the most stylish hairdresser I've ever known! Love the pouch and love the fact that it brings a flash of colour to your chic black ensemble. I'm mobile based at the moment, would love to get into a salon at some point though.